Edinburgh Castle is one of the iconic images of Scotland, with hundreds of thousands of visitors each year. This Castle Guide tells the story of the castle through many centuries, and will take you on a tour which shows you all the major sights, and some not as well known. The Castle Guide is divided in two parts, both extensively illustrated. The first part is the history of the castle and site, how it developed to become the most powerful fortress in the land as well as the bloody deeds done here from the earliest times. This is the real story of Edinburgh Castle that you won’t find elsewhere. 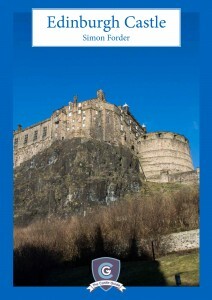 The second half of the Guide is devoted to an extensive tour of Edinburgh Castle. Following a logical path through the castle, all the major features are discussed, and significant features highlighted, as well as some of the less obvious features. For security reasons, photographs of inside the Palace and of the Scottish Regalia have not been included. When purchased, you’ll be able to download your Castle Guide as a pdf.